While Anaheim is famous for world-renowned Disneyland and is the home of the National Hockey League’s, Anaheim Ducks, it is also the home of Abyssinia Restaurant specializing in Fine East African Cuisine. If you want to experience authentic Eritrean and Ethiopian food and culture, look no further. The superior quality of food and the welcoming nature of the owner draws locals as well as diners from all of Orange and Los Angeles Counties. When Mom said don’t eat with your fingers, she didn’t know about Eritrean and Ethiopian food! Location: Abyssinia Restaurant is located at 2801 W. Ball Road in Anaheim, California, between Beach Boulevard and Dale Avenue. Menu: The lunch and dinner menu include many tempting vegetarian and vegan dishes, as well as beef, lamb, chicken and fish dishes. You can select a vegan or vegetarian breakfast of beans or scrambled eggs, all with the option of spiced, infused and flavored butter. The Traditional Combo is, of course, meant to be shared. It includes chicken, lentils, cabbage, collard greens, beef with house blend herbs, fresh tomatoes, green peppers, onions, berbere (spiced red pepper powder) and spiced, infused and flavored butter. These mounds of flavorful tastes are served over injera on a large round platter. All meals come with injera, the fermented sourdough bread used to scoop up the food with your fingers. Thoughts: While on a trip to Michigan this spring, I was introduced to Ethiopian food. 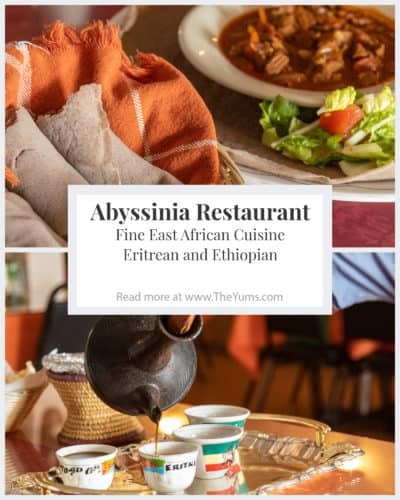 Eager to learn more about the culture and cuisine, upon my return to Southern California I discovered the Abyssinia Restaurant close to my home in Orange County. After my first visit, I knew I had to share my experience, so I returned for an in-depth interview with the owner, Mr. Mehari Woldeslassie. The signature food of Eritrean and Ethiopian meals is injera. Injera is the traditional bread that complements the exotic spices of this regional food. All meals are eaten with just your hands using injera to scoop up the food and carry it to your mouth. Injera is a sourdough bread that is gluten and fat-free. It is made from one of the smallest grains in the world that have been around for over 4,000 years. It is high in fiber, protein, vitamins, and minerals. After the grain has been ground, mixed with water and fermented for four days, it’s then cooked into a very thin pancake (or crepe) about one foot in diameter until the eyes (bubbles) form. The entree is served on a platter over injera which is consumed during the meal. Injera is also rolled and served in smaller pieces in a basket or on the side. A substantial amount of vegetables makes up Eritrean and Ethiopian meals. Traditionally, it was more convenient and less costly to grow vegetables in one’s yard, and meat was not plentiful in the diet. Vegans and vegetarians find this East African cuisine quite appealing. The key ingredient in Eritrean and Ethiopian food is berbere, a spice mixture that includes chili peppers, garlic, ginger, basil. Also added are less well-known spices that are cultivated plants and wild-grown in Ethiopia such as korarima, rue, ajwain, radhuni, nigella, and fenugreek. Similar to Indian food, Eritrean and Ethiopian dishes can be spicy or mild, depending on the amount of added spices. I prefer mildly spiced dishes, yet the lamb dish I ordered was full of flavor and had plenty of zings. Abyssinia Restaurant is modest, colorful, very clean and offers simple dining. Mr. Mehari has a passionate heart, and the quality of the food is paramount to him. His restaurant enjoys many 5-star reviews, and he goes out of his way to please his customers. In fact, he honored me with a version of the coffee ceremony during my second visit. The traditional coffee ceremony is typically performed by the woman of the house, is considered an honor, and mainly to get together with visitors, neighbors or relatives. Green coffee beans are roasted in a pan over an open flame, and the smoke is shared with the participants. The roasted beans are ground and inserted into a special pottery vessel with hot water and allowed to boil and brew for several minutes followed by the host pouring the thick, dark coffee into small cups from a height of one foot without stop until each cup is full. There are three rounds of the coffee pouring, and it includes the burning of incense and popcorn as a snack. The rich liquid lifts the spirit without delivering coffee jitters. All my senses were employed during my visit to Abyssinia Restaurant. The traditional coffee ceremony corner provides visual interest along with the colorful tablecloths. The classical music, the scent of specially roasted coffee beans and incense, the delectable flavor of unique spices, and the feel of eating with my hands using the injera brought together a truly unique experience. You don’t need a reservation during the weekdays (unless you are holding a business group meal), but word-of-mouth is bringing a growing crowd on Fridays and Saturdays, and you may have to wait for a table. The breakfast menu is priced from $7.99 to $10.99. Hot tea and coffee are $2.00. Cold beverages are $1.50 to $2.00. Domestic beer is $3.50 and imported from Ethiopia and Eritrea is $5.00. Disclosure: Both times I’ve eaten at Abyssinia Restaurant I have purchased the meal. During my second visit, Mr. Mehari treated me to the coffee ceremony so that I could experience a traditional presentation.